Cyanobacteria, or what is commonly referred to as Blue-Green algae, can grow so profusely that it can impart an objectionable odor, taste, and appearance to the water. 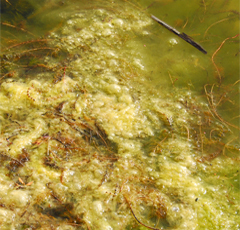 Cyanobacteria (technically a bacteria, not an algae) comprise a single class, Cyanophyceae. Cyanobacteria are often mistakenly classified as algae (Blue-green algae) because of the chloroplasts contained within the cells. This diverse group of cyanobacteria can exist in all settings from freshwater to terrestrial settings and from oligotrophic (low nutrient) to hypereutrophic (very high nutrient) environments. Changes in the ratio of nitrogen to phosphorus (N: P ratio) can affect algal species composition within a given lake. Some species of cyanobacteria (blue-green algae) have a competitive advantage over other algae by having the ability to fix nitrogen, whereas other types of algae cannot. Nitrogen fixation is the process of converting unusable nitrogen (atmospheric nitrogen) into usable nitrogen (ammonia). This characteristic allows these species to exist in areas where low nitrogen availability inhibits growth. Therefore, under phosphorus-rich conditions, when nitrogen may be limited, blue-green cyanobacteria algae have a competitive advantage because they can utilize ("fix") nitrogen directly. Cyanobacteria can also successfully compete against other groups of such as green algae and diatoms because they can store phosphorus for later use, and are not preferred as food by zooplankton (microscopic animals), larval fish and other animals that graze on many kinds of algae. 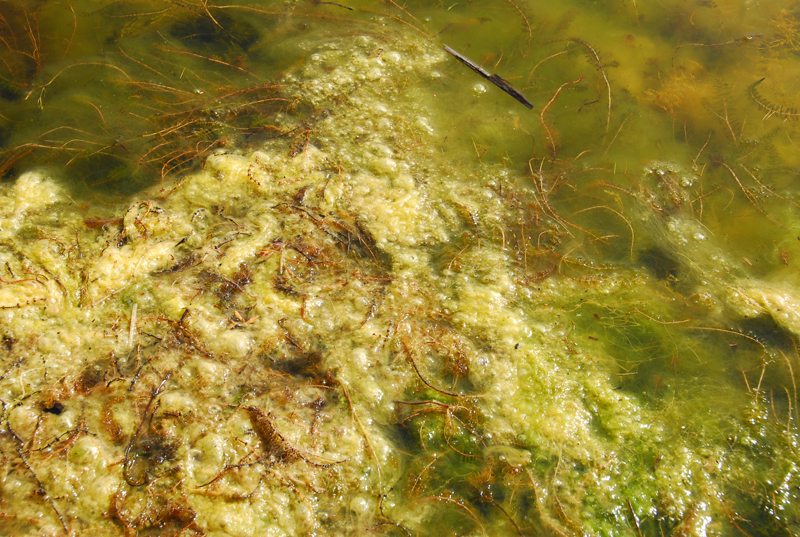 In fresh water systems, many blooms are due to members of the cyanobacteria family. They can grow so profusely that they can impart an objectionable odor, taste, and appearance to the water. Many of these cyanobacteria release toxins into the water, causing health concerns in both animals and humans. People exposed to the cyanobacteria, blue-green, algal blooms by swimming in affected lakes or rivers have experienced skin irritations, allergic reactions, gastrointestinal symptoms, and respiratory problems. * Typically produce these blooms are planktonic, or free-floating organisms, that can become distributed throughout the water body.